I often use my Good News Friday postings to brag about all the great things that Imagine! does. Which makes sense – I am very proud of our organization and our achievements. But I’m not so proud as to not be aware of the fact that many other organizations around here also do a great job of providing opportunities for individuals with cognitive disabilities to become active participants in our community. One example of such an organization is the Association of Community Living in Boulder County, Inc. The ACL provides many classes and opportunities for social activities, and you can learn more by visiting their online class calendar. Another local organization we are pleased to be associated with is the Autism Society of Boulder County. The ASBC assisted us in creating one of our most unique programs, our Autism Spectrum Disorder Program, and they also host a wide variety of meetings and events, including an ongoing lecture series and support groups for parents. There are so many other organizations we work closely with here at Imagine! that I can’t possibly list them all without this post becoming unwieldy. But we do our best to keep our constituents informed about events, happenings, classes, and lectures that may serve as resources to consumers, families who have a family member with a developmental disability, service providers, Imagine! employees, or members of the community at large through our web calendar. Please take some time to check out the calendar to see what others in our community are doing to improve the lives of local citizens who have a developmental or cognitive disability. I think you’ll come away very impressed with the depth and breadth of the opportunities that are out there! Now, I haven’t come to this belief by accident, and I want to make it clear that I’m not expecting everyone else to do all the heavy lifting in terms of discovering new solutions. Here at Imagine! we have already designed and implemented several programs with a stated goal of providing quality services that go outside of the traditional models of service delivery that have gotten us into the mess we’re in now. An example is Imagine!’s Autism Spectrum Disorder (ASD) program. In 2004, working closely with the Autism Society of Boulder County, Imagine! created this unique program designed to offer flexible and responsive services to improve the living situation of local children who have an Autism Spectrum Disorder. The program is simple. Qualifying families receive an annual allocation of funds for three years. These funds are directed toward focused services designed to treat specific areas of need, providing a pathway to improved social and emotional skills and an enhanced ability to participate fully in the community. The ASD program is extremely cost-effective. Online registration and web-based service management significantly reduce administrative costs. The program is also designed to best meet families’ needs, operating on a self-determination model that puts families in charge of determining what resources they use. Families get a monthly statement, similar to a credit card statement, showing what services they ordered. My point here is not to brag (at least too much) about the program. In fact, I don’t claim it is perfect. But it has several very important strengths that are worthy of exploring, including the ease of use, the community collaboration, the family-directed nature of the services, and the extremely low cost. To take this model and apply it to other areas of service delivery in our field would not be difficult. The resulting cost savings would allow us to serve more individuals (and serve them just as well or even better than we are serving them now), a critical need considering the number of people currently waiting for services here in the state. Imagine!’s ASD program is just one example of a possible alternative to the system we have now. There are others. We owe it to the individuals we serve to start looking at those new models right away, before the crisis in our State reaches a point where lives are endangered by our inability to serve some of our most vulnerable citizens. I am really looking forward to the 9th Annual Imagine! Foundation Celebration Dinner and Auction, scheduled for January 29, 5:30-10:00 p.m. at the Radisson Conference Center in Longmont. The Imagine! Foundation has always felt that the end of January is a perfect time for its annual fund raising event, the Imagine! Celebration. The holidays are long gone, everyone is a bit weary of snow and cold (except, of course, in the high country! ), and after the January lull, people are ready to get out again and mix a bit with colleagues and friends. The Celebration prides itself on providing not only a great time but also a genuine sense of the importance of the work Imagine! does every day for people with developmental disabilities. The honoring of Imagine!’s Consumer of the Year is always the high point of the event. This year’s recipient, Doug Coker, is certainly deserving of this prestigious award. Doug was recently profiled in an article in The Longmont Times-Call, which you can read here. The picture to the right shows Doug between Times-Call reporter Maggie Wegrzyn on the left, and Times-Call photographer Jill Mott on the right. Congratulations are in order for Doug, because this award is really about how he was able to use the supports he received from Imagine! to become a leader in our community. If you are interested in attending the Imagine! Foundation Celebration and meeting Doug in person, there is still time to purchase tickets. Ticket and table sponsorship prices remain the same as last year, $95 per ticket or tables of ten for $1,250. Purchase tickets quickly and easily online here. This week I am stepping outside the boundaries of the world of cognitive disabilities for a brief tribute. You see, some colleagues of mine insist in a simple wager during the course of the NFL season. The object is to identify teams that you think can make the most remarkable turnaround from season to season. Picking the best team each season is apparently too easy. The wager is a cup of coffee to winner along with public humiliation to the losers. Anyone who knows me would realize the lack of rules and potential for significant rewards makes this a perfect challenge. Even though I ended the regular season with arguably the hottest team in the NFL, I was bested by none other than our own Fred Hobbs, Director of Public Relations. Hours of studying film, team strategies, rosters, back office personnel, and off-season deeds, led Fred to the winning combination. I offer my congratulations to Fred. I have suffered humiliations galore while he takes the throne as king of the NFL hill. Once again, what do I know? Many of you are already familiar with Imagine!’s ambitious SmartHomes project. This project has been recognized nationally and internationally for its unique and game-changing approach to the delivery of services to individuals with cognitive, intellectual, and developmental disabilities. There is more good news regarding the SmartHome being recognized for excellence: the Bob and Judy Charles SmartHome has been nominated for a Colorado Governor’s Excellence in Renewable Energy Award. The annual award honors those individuals, businesses, institutions and nonprofits that are advancing renewable energy in exemplary ways. The SmartHome is also a nominee for an ANCOR Foundation Community Builder Award, which recognizes exemplary and praiseworthy initiatives of individuals and communities and/or community organizations that create community inclusivity through opportunities for people with disabilities to build social capital and live full, meaningful lives in their community, as contributing and valued members of their community. And last but certainly not least, SmartHome guru Greg Wellems has been nominated for an American Association on Intellectual and Developmental Disabilities Leadership Award for his visionary work on the SmartHome project. This award honor selected individuals or groups who have made outstanding contributions to the field, and will be presented at the organization’s 134th Annual Meeting. Congratulations and good luck to Greg and the entire SmartHome team for creating a project that has attracted so much interest and honor. That was my initial response when I saw the letter from the Colorado Department of Public Health and Environment last week. Let me give you a bit of background. Forget that the deadline to apply was two days later, and that the State Departments were not open either of those two days. I am used to short notices and even notices that are retroactive. Despite the facts that a) we had so little time to prepare, b) we don’t agree with this interpretation of the statute that led to this request, and c) we know that this interpretation is being debated and may change, we still went ahead and issued a letter of intent to apply for the license to keep us in good standing. Considering their names don’t explicitly state what sorts of services they provide, I expect we will be hearing from a lot of bewildered CCBs who are being asked to change their names. And to add a little regulatory salt in the wound, “Any facility shall notify the Department of any proposed name change. If the Department determines that such change would create confusion or misrepresentation to the public … it may disapprove such name change." Of course I am in complete agreement that it is necessary to have protections in place for consumers who receive home care (that is what the original statute that led to this whole mess was designed to do). But what does our name have to do with protection of consumers? Why should we undergo the costly and time consuming process of changing our name? How does that do anything to improve our services or the efficiency with which we deliver those services? Believe it or not, my purpose here is not to place blame or point fingers. But surely you can’t be serious! Instead, I want to use this as an example of the lack of a coordinated effort between all parties engaged in the funding and delivery of services to individuals with developmental disabilities that has made our current system unsustainable. If we truly want to create a system that can appropriately serve some of our most vulnerable citizens and ensure the taxpayers of our state get the best bang for their buck, we need to work together to make sure the system’s rules and regulations work in concert to reach an agreed upon goal of the best possible services. All interested parties, including the State, CCBs, provider organizations, parent groups, etc., need to part of a choreographed solution. Otherwise, we will continue to waste valuable time and resources on dealing with issues that have nothing to do with serving individuals with intellectual and developmental disabilities. Imagine!’s mission is grounded in the belief that providing individuals with the opportunity to engage in the community benefits us all. What I find so exciting about working at Imagine! is that so many of the individuals we serve take those opportunities and do us one better – they become leaders in the community. Case in point: Imagine!’s C.O.R.E./Labor Source department recently started a journalism class, entitled Community Columnists, in which consumers write reviews about movies, books, music, restaurants, etc. for publication. Although the class is only a couple of months old, these consumer journalists have already made it to the printed page. 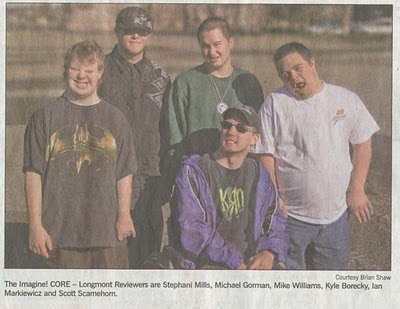 Recently, they have had two articles run in the Longmont Daily Times Call. You can check out those reviews here and here. That’s what I mean by the consumers becoming community leaders through this endeavor. By putting pen to paper (or more likely, finger to keyboard) and sharing their views, our consumers are demonstrating in a very powerful and public way just how much they have to offer. Congratulations to our reviewers, and also to the staff members at C.O.R.E./Labor Source in Longmont for making this class a reality.